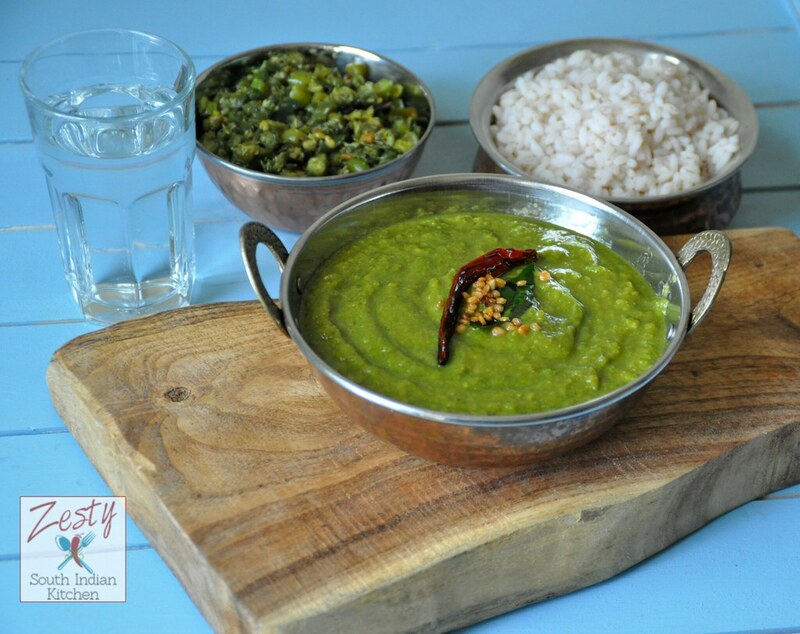 Delicious greens and lentil with touch of coconut and mild spices. Heat is killing us; yes it is very hot outside even after 7.30 PM the temperature it is high. So my plants are drying up even after watering every day. No matter how many times we water the plants, plants like rain rather than the tap water. I wish it would rain for a day, don’t know when my wish will come true as the weatherman is predicting another hot weekend. 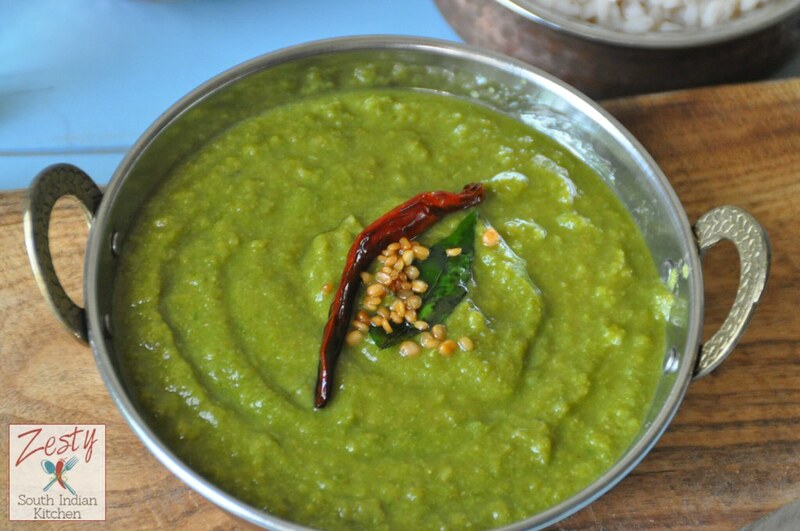 Coming to this Keerai Moolagootal, it is one of typical Tamil Brahmin Palakkad style recipe. Yes it is around 217 miles from my home town Thiruvanthapuram. I make this dish very often however only got a chance to take the picture yesterday. I learnt this recipe from this blog Ammupati’s thoughts; I don’t know why aunty is not blogging now, may be busy with her grand kids. She makes traditional recipes just like my mom and grandma. I like to refer her recipes. Our normal lunch or dinner menu includes rice, a curry, side dishes like thoran or mezhukupuratti , spicy pickle, and is sometimes accompanied by pappadam/ fried wafers made of urad dal/split black gram. I buy spinach for hubby‘s lunch box, and do make spinach rice very often, but sometimes I make Keerai sambar/ Spinach and dal spicy curry just like my mom. 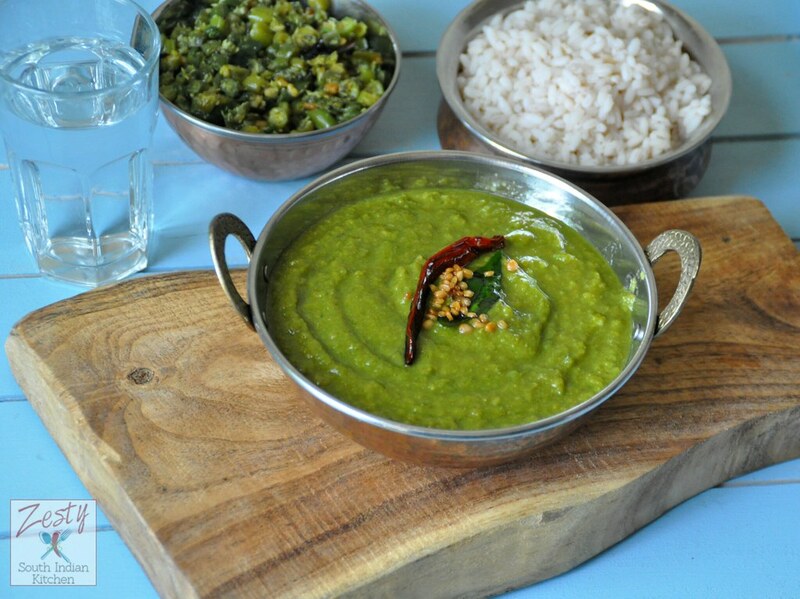 She adds sambhar powder to everything that is her secret ingredients to make tasty dishes. Since I made spinach rice and Keerai sambar already this week I decide to make Keerai molagootal. The taste is a blend of all the vegetables, and lentils, and fresh coconut. Molagootal can be made with mixed vegetables (raw banana, pumpkin, winter melon, chena, koorka, payar), spinach (keerai), banana stem, cabbage, broccoli you name it. However traditional recipe is with spinach (kerrai) and that too has variety. Since it is a traditional recipe, mom and grandma used the vegetable available in their backyard garden. I still remember my grandma’s spinach garden; she would plant both green and red spinach. I love red spinach thoran also which I miss here. Also miss any time tea drinking habits. Yes in Kerala, we just go out drink tea any time of the day. We used to ask our friends, oru chaya kudikan poruno? Are you coming to drink a tea? Coming back to Keerai Molagootal you need a bunch of spinach, half cup fresh grated coconut. 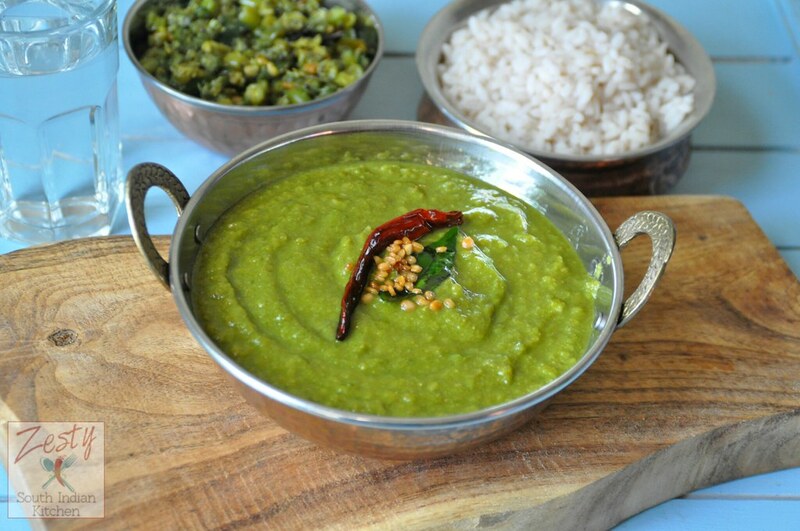 Spice up with green chili flavor them with little cumin, that is it your keerai moolagootal is ready. Here comes the recipe. Next traditional recipe which in list is Keerai masiyal. Delicious Keerai Moolagootal made with spinach, lentil and coconut, mildly spiced curry goes well rice. and cook until it is soft and set aside for cool grind to a paste. Pressure cooks the toor dal with turmeric powder. Heat 1 tsp of the coconut oil to this add 1 ½ teaspoon urad dal and 2 red chilli broken into bits, fry till the dal is pink in color. Remove from the heat. Grind coconut with fried dal and chili and cumin seeds/ jeera to a smooth paste. Add the cooked toor dal and boil for 5 minutes. Add the ground coconut paste and add enough water to get pouring consistency. Then add the spinach puree with salt and bring it to boil. Heat the remaining oil, add the mustard seeds when they splutter, add the urad dal and curry leaves when the dal turns pink, pour into the keerai molagootal. Your Keerai Moolagootal looks awesome and tasty, Swathi! The pictures are gorgeous as well! Pinning! This is what I call a perfect blend of colour and texture with spinach blended with lentils. Must have tasted amazing. healthy and delicious keerai curry ..nice to know a new curry .. Spinach, lentils and coconut sounds like a great combo! Can’t wait to try this hearty dish! Looks so delicious….. Love the color! healthy finger liciking keerai kootu. We went oh wow when we saw the words…spiced spinach lentil coconut curry. Love to have this now with some chapati or roti to mop up the sauce…mmmm!! This is my favorite of all molagootals.. we don’t puree the spinach, just finely chop them.. looks so good..